Camping is a great outdoor activity that lets you breathe some fresh air from lush green nature. 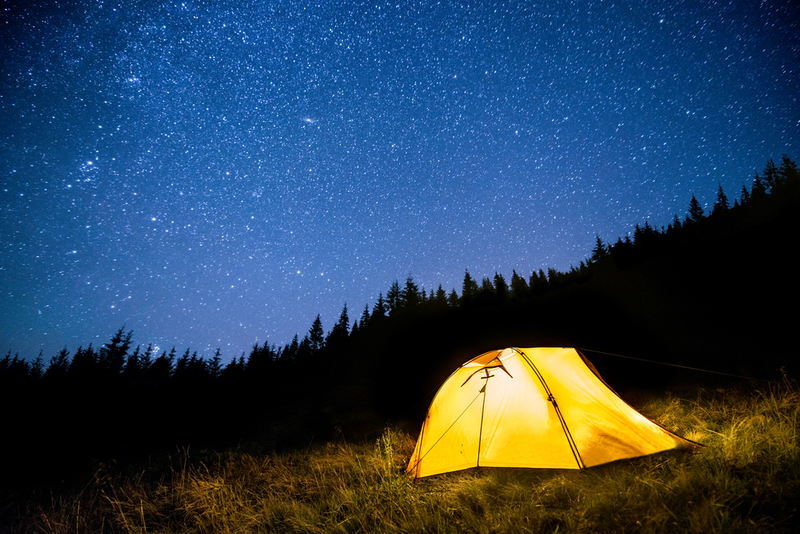 Spending night in a tent beside a Forrest is a great opportunity to enjoy the star-studded night sky. Camping is also a great opportunity to break from our monotonous life and appreciate nature. Campers get different sleeping experience when they fall asleep outside. So, camping is enticing. Are you planning a camping trip for the first time? In this post, I have discussed Camping tips and tricks for beginners that I hope will help new campers for a memorable camping trip. Planning for a camping trip kicks off when you are longed for going to the lap of nature. The planning process involves choosing a date, select a campground, pick a route, gather all necessary gear and stuffs for the trip. The process is not a complicated one but requires some careful planning. Let’s breakdown the entire process and discuss them separately. Our first step is to pick a date. You need to plan to stay outside for at least two to three days. I feel this is a sufficient amount for a relaxing camping trip. The second step is finding a campground. The success of your camping trip mainly depends on selecting a beautiful campsite. While searching for a scenic campground, you will find two types of campsites out there. One is private and the other is public. Both public and private have advantages. While selecting a campsite, several criteria come into play. One such criterion is where you will stay? Is it in a tent, RV or in the camper? Some campgrounds are suitable for setting up a tent while some others have all the conveniences for campers. Another important criterion is the toilet. Do you need a shower and flushing toilet in the campground? Modern campgrounds include different amenities, for example, pool, store and game room. While selecting a campsite, it is important to keep in mind that not all campgrounds are readily available. Some require prior reservation. So before selecting a site, make sure that the site free to camp or it requires prior reservation. My preference is selecting a campsite near a forest. I prefer such site because it allows campers to get a different experience-watch the nocturnal life of wild animals silently by using a night vision binoculars. We will back to this discussion later of the post. The third step is to gather all of the necessary things and gears. Below I have described a few essentials that you must bring with you while going on a camping trip. Many campers don’t miss hiking while on a camping trip. After a hectic day which involves hiking through rugged mountainous terrain, campers get tired. Upon returning to their campsite, they need a good night sleep to refresh them and get ready for the next day of adventure. In this situation, a sleeping bag is a useful thing to sleep on that also keeps campers warm. To get a more comfortable sleep, you can also use pillows, blankets, camping mats, air mats. A tent is another essential thing for campers. You can go camping without a sleeping bag, but camping without a tent is unthinkable. While choosing a tent, a few things are immensely important. The first important criterion is how many people will go on the trip. There are different sizes of tents on the market, for example, 2-people tent, 3-people tent. So, depending on the number of companions select the proper size tent. The second important thing is the quality of tent. An expensive tent will provide you a better camping experience. The third criterion is how easy to set up the tent. Nothing is more frustrating than bringing a tent to a campsite that is difficult to set up. Campgrounds become pitch dark during the night. Walking, cooking is impossible after the sunset. A cheap LED light is a better solution to do things at a nighttime time. Campfire is not enough to eat dinner and illuminate camp premise. A camping lantern is a useful device that provides bright light. The device is inexpensive, easy to use. What’s more, you can hang the lantern from a tree. During hiking several unexpected things can happen like scraping, bruising, and cutting. So, bringing a first aid kit is a good idea. If your camping during summer, chances are high that you will experience sunburn. Add sunscreen to your list. Bugs and mosquitoes will make your nighttime sleeping measurable. So, don’t forget to bring Bug and mosquito repellents along with you. Food is an indispensable thing. Your wellness depends on the food you consume. Select a menu that is easy to make over campfire or stove. You also need to bring cattle to make boil water to prepare coffee and hot chocolate. Select fire-friendly foodstuffs for example sausage, steaks, beans for dinner while on camping. During camping, keep your lunch menu as simple as possible. A cold sandwich is a good choice as a lunch menu. At breakfast, you need energy-rich food. Slices of bacon and eggs are calorie-laden food. So, your breakfast menu should include eggs and bacon. Oatmeal is also a great breakfast menu. The food is particularly useful if you are on a rush and need to complete your breakfast quickly. While on a camping trip, you can do several interesting things, for example, nature tour, picnics, hiking, fishing. Engaging in those activities is a lot more fun than passing the time idle. And most campers like to do one of those outdoor activities. However, here we like to introduce one exceptional idea-watching wildlife activity by using night vision binocular when nightfall. Yes, I agree it’s an unorthodox practice. But why not try something different to get a different camping experience? While on a camping trip I did it myself and gained a unique experience that I shared with my friends later on. I got the idea that watching the nocturnal activity of wild animals using night vision binoculars is a fantastic experience from reading a review. In the past, night vision binoculars were primarily used by the military. But now civilians are using the device for different purposes. Two common civilian use of the device is hunting and wildlife observation. To do the activity you need to carry one extra thing with other things. The extra stuff is a tree stand. Do you know what tree stand is? It’s a hunting accessory that hunters use as a platform. What hunters do with tree stand is they attach the tree stand with a tall tree and climb on top of the platform. The platform gives them a better view of the animals they want to hunt. However, in this case, we won’t hunt any animal. Instead, we will watch them silently at dark night using our night vision binocular. In this way, we will explore what wild animals do after sunset. Pretty good idea, isn’t it? Camping is a great idea to enjoy pristine nature. It lets you unplug you from your busy life schedule. Lost in the wilderness for some time while enjoying the mellifluous song of birds, get the woody scent. In the above post, we try to give you some necessary tips and tricks for beginner campers. Our last tip is as a beginner; don’t prolong your camping trip. Staying two days and one night will give you an unforgettable camping experience. Go camping for the first time and enjoy every moment.